In this beginner class we will make a perfectly fitted cushion cover for your sofa or your bed. It will have all edges nicely finished with multiple buttonholes and buttons used to close it, but also to provide a decorative element. Using contrasting thread for your stitches and buttonholes will make it stand out. 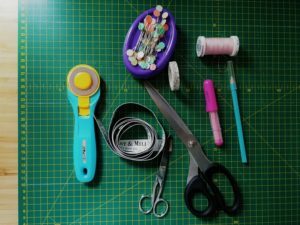 All beginners who have some minimal sewing experience (e.g. hand sewing/mending). If you are an absolute beginner you can join this class, but we would recommend you to complete our Introduction to Sewing: You and Your Sewing Machine class first. All sewist who are keen to learn about creating perfect buttonholes and making a gorgeous cushion. Buttonholes - essential for every day items, not only useful but also decorative. Making buttonholes is a key skill for any sewer, and with our 1 step buttonhole functions, it will be a walk in the park.